The Local Batik Software is now become a trend in the world ~ " World Information "
Jakarta - Potential local developers considered no less than foreign tourists. 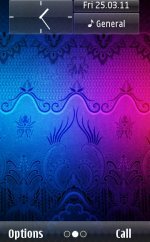 One proof of this, there is a personalized content themes with theme Batik Indonesia is the largest number of downloads at the shop Nokia, Ovi Store. Total weekly reach the range of 11 million times. "The theme of Batik Indonesia had signed the order of the five most downloaded applications globally, only losing to Birds or Fruit Angry Ninja. This proves that local developers have the potential," said Narendra Wicaksono, Developer Marketing Manager Nokia. On the other hand, the potential applications market in Indonesia is still considered promising. Nokia claims, the application downloads Ovi Store in Indonesia is high. Even the highest in Southeast Asia, with the number of downloads of about 1 million per day. While in the global sphere, Nokia mobile phone itself has been present in 190 countries. This is seen as a huge market for application developers who want to incorporate his work into Ovi Store. "Nokia is trying to help local developers to make money from applications that go into Ovi Store," says Narendra. Nokia has established cooperation with Telkomsel so that the user is possible to buy an application with pulse cutting system. This is expected to make the buying process is not complicated. A total of 15 thousand applications premium on Ovi Store can be purchased in this way. For developers who want to incorporate the work into Ovi Store also claimed not difficult. Simply register on the website Ovi and pay 1 Euro, then the application can be processed for inclusion Nokia Ovi Store. It's just that there is a quality control process to ensure applications are included to meet eligibility standards. For example, does not contain a virus, does not damage the phone and good performance.